It’s been a while since we’ve updated you about goings on around the farm, so we thought we’d let you know what we’ve been up to. After the usual quiet winter, we’ve made a flying start to the growing season this year. 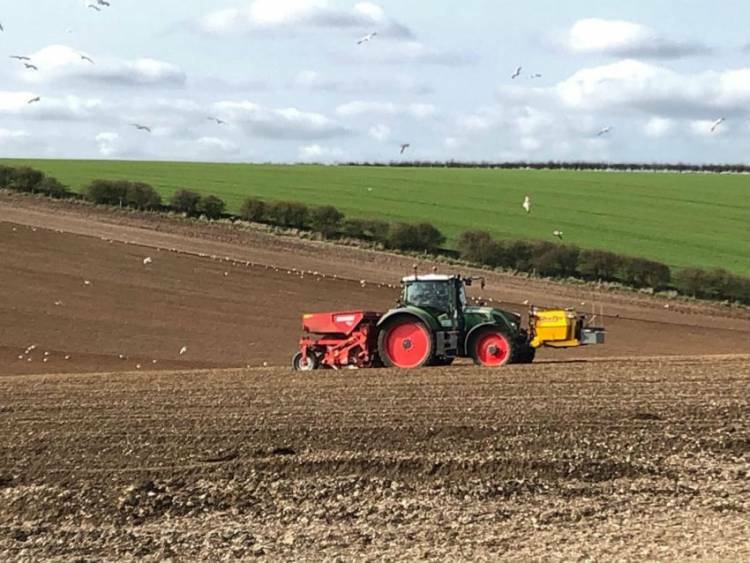 We’ve already sown our spring beans and spring barley, and last weekend were able to start potato planting (see our video, below), all due to the early spring. Now all we need is rain and lots of it! For the first time in several years we’re growing a field of vining peas. As new growers in one of the local pea groups, we’re enjoying learning all sorts about peas and meeting a whole host of lovely people. We’re also preparing to plant another field of borage this year, which will mean asking our local beekeeper friends to hopefully bring along their hives during the flowering season to help pollinate the crop which in turn allows the borage seeds to develop. The seeds are part of the borage crop that we harvest. The better the pollination job done by the bees, in theory, the better the yield of the crop. Of course, there are many other factors at play which influence this – not least the weather, and that is one thing that we can do absolutely nothing about. Borage flowers allow bees to produce a particularly delicious honey which is quite specific to a borage crop and we are very grateful for the odd jar or two of honey which the beekeepers often kindly offer us often during the summer. In preparing the fields for the sowing of the peas and borage, the soil has been worked to make a “stale seed bed”. This is a clever technique whereby the weed seeds begin to germinate but are then destroyed during the sowing process – the idea being that most of the weeds are eliminated for the rest of the growing season. At least that’s the plan. Although we love to see all the changes the seasons bring to our beautiful corner of the Yorkshire Wolds, there really is something special about spring and the new life it brings. We absolutely love the fresh spring green which is appearing across the Wolds, throughout all of the hedgerows, woods and trees and across the fields which are currently turning from brown to bright green. We’ll look forward to updating you again once we have some exciting green shoots to show you!